"WHO HAS SEEN THE MACKEREL?" The mackerel rumour is very widespread...although the mackerel itself may be a different story. In the course of a discussion on the changes in the marine ecosystem as a whole, it has been suggested to me that the unusually abundant mackerel stocks are probably one factor inhibiting the groundfish recovery. The reasoning is that the mackerel (primarily a plankton feeder) are eating major quantities of the planktonic larvae of the groundfish. It also came up in a discussion about the reasons for the apparent current malnourished state of the northern right whales...that hordes of mackerel are competing for the same food as the whales, and thereby contributing to their decline. Relative continued success of mackerel would be expected, even by myself, at this time due to the scarcity of their natural predators (e.g. cod) and the fact that they feed at a very low point in the food web (plankton)...but I now seriously doubt the true extent of their “success” at this time. So what do we know about “Scomber scombrus?” And how do we determine how many of them are in the sea? Mackerel are migratory fish that normally travel long distances on an annual basis. They also have a preference for warmer water temperatures so their appearance in an area generally coincides with that particular “environmental factor.” So it is not entirely predictable that schools of mackerel will be or “should be” in certain places at certain times - their movements are variable. What mackerel do consistently, however, is use the same spawning grounds year after year. Based on this knowledge, surveys of egg abundance are done in these areas, during the spawning season, every second year (by DFO) as a method of estimating “spawning stock biomass.” This appears to be one reasonable approach to assessing a fish stock like this one. Another thing that is recorded is “landings” - but that’s an unreliable way to estimate the actual stock abundance due to numerous other factors that affect how many mackerel are caught, including variable degrees of fishing effort and changing market conditions. “Landings,” nevertheless, still do provide one part of the picture. Do recent records of mackerel landings indicate the presence of an unusually high abundance or “biomass?” NO, landings have been declining in most areas over the last decade. And these landings have only been a small fraction (less than 1/10 th) of the record high landings that were caught during the “great foreign fishery” of the late 1960s and early 1970s. Although not at all conclusive, this contrast seems to imply that the mackerel biomass “may” have been significantly higher several decades ago than it is now. The recently collected landings statistics do not include a few sectors of the fishery, notably mackerel caught by anglers (“tourists”) and mackerel caught for bait. At least in some areas of Nova Scotia, the bait mackerel fishery has been a complete failure in recent years. This is far from “conclusive,” but, at least on the surface, it does not appear to support the “very large mackerel biomass” contention. So what have been the recent results of the egg abundance surveys? Were higher-than-normal numbers of mackerel eggs discovered in the spawning areas? Strangely, the answer is again “NO,” quite the opposite has been found in fact. 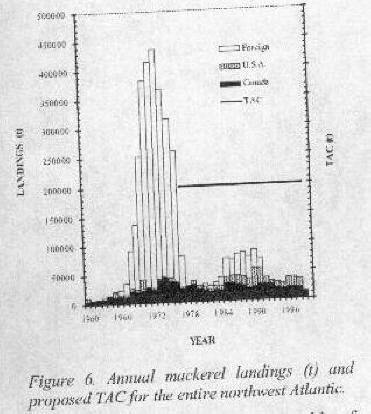 The results are described in DFO’s Science document “Atlantic Mackerel of the Northwest Atlantic - Stock Status Report B4-04 (2000)” On page 2, regarding the egg surveys: “Spawning biomass increased between 1983 and 1988 before shrinking and stabilizing between 1990 and 1994. Values obtained in 1996 and 1998 are LOWEST in the series...” The explanation for the low egg count in 1996 is that the survey was ill-timed due to “technical problems” and therefore “did not coincide with the peak spawning period.” Fair enough, so no good conclusions can be drawn from the 1996 data...which certainly CANNOT be interpreted to demonstrate a high level spawning biomass. In 1998, however, the egg survey also came up with low numbers of mackerel eggs. There were no technical problems this time, but the low egg count was explained on the basis that it appeared that the mackerel had begun to spawn much earlier than usual and therefore the egg “peak” had again been missed by the survey crew. How could results like these possibly have been translated into the “rumour” of very highly abundant mackerel? So, calculations aside, what else has actually been OBSERVED about the mackerel in recent years? Well, the experience of my friends who were unable to catch the usual bait-mackerel for their lobster fishery...apparently was not unique to them alone. According to the DFO document, concern about the patchy appearance of mackerel was also voiced by fishermen in the Gulf area: “...the abundance of mackerel in certain places only, but not throughout the Gulf.” For some reason these fishermen also felt a concern about “the danger of overfishing the resource.” I have to wonder what “signs” those fishermen were reading, because, unlike DFO, I definitely agree with them on this point of concern. Mackerel roe (eggs) is considered a delicacy in certain circles. But last year it proved to be impossible to find any “decent” roe to eat - the problem was that the roe was uncommonly small, thin and “bloody.” I heard this complaint locally from older people who have “cut roe” and eaten it for over 60 years. The mackerel roe in 1999 was the poorest that they had ever seen. What observations did the scientists make about the mackerel roe last year? Apparently mackerel are “multiple spawners,” which means that they spawn repeatedly during their reproductive season, therefore not releasing all of their eggs at a single time. So as the spawning season progresses it is normal to find fewer and fewer eggs/fish, i.e. smaller and smaller size roe. Scientists do pay attention to the size of the roe and they look at it in relation to the size of the fish overall. A statistic called “gonadosomatic index” (GSI) captures this information. 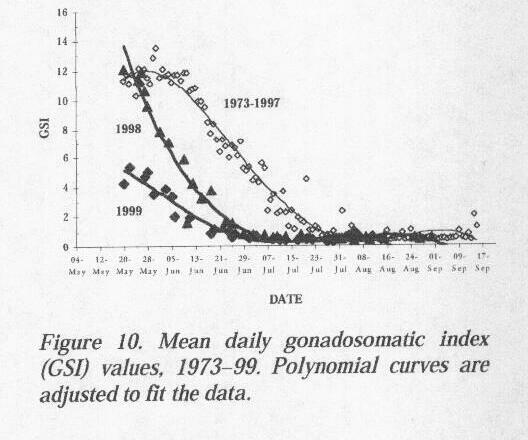 In the mackerel stock survey report that I have been referring to, trends in “GSI” from 1973-1999 are illustrated in Figure 10. This graph deserves a VERY close look. It shows that in the last two years there has been a drastic departure from the earlier normal pattern in the GSI. Even worse, it shows a major negative change between the last two years, 1998 and 1999. The usual peak for GSI (1973-1997 average) is about 12%, and the peak normally occurs in late May-early June. After the peak, GSI tapers downward (demonstrating half of a bell-curve) and normally bottoms out late in July, at which point the spawning season has ended. The data for the years 1973-1997 was able to be nicely approximated by a single curve. In 1998 the GIS peaked at the same level (12%) and at almost the same time as in previous years (late May), the real difference being in the steepness with which the curve dropped, so that it bottomed out (spawning came to an end) significantly earlier (late June vs the traditional late July). So the mackerel released their eggs more quickly than usual in 1998, in fact they were finished a whole month earlier than usual. What conclusions can be drawn from this, or what does it suggest about changes in the ecosystem or in the mackerel stock? The proposed explanation in the literature is that the spawning occurred much earlier than usual because the water was warmer than normal. This could reasonably be a factor, but the sudden change between 1997 and 1998 does not really correlate to a “sudden” increase in water temperature...temps in the late 1990’s have all been warmer on average than temps in the early 1990s. Could any other “environmental factor” be presumed to have an effect on the timing and the duration of mackerel spawning? This is speculation of course, based on my different interpretation of the trends in the system overall, but I would suggest that if mackerel were experiencing a shortage of energy stores, they might reasonably release their eggs earlier and more quickly than usual. Why? Because it seems that they do not commence feeding until they have finished spawning. Once they start feeding, mackerel store energy to carry them through the winter and the next spawning season. (Mackerel are well known to be thinnest in the spring and fattest in the fall. Anyone who cooks them is well aware of how much fat is usually rendered out when using “fall mackerel.”) The need to spawn earlier because of an urgent need to start feeding, a result of overall “hunger” in the ocean, I think is a plausible part of the explanation...although it is certainly not “proven” yet. What happened in 1999? Well, despite the clue from 1998 that mackerel were spawning earlier than usual, the DFO data collected in 1999 still missed the “peak.” Whoever scheduled the fishery and collected the data didn’t anticipate the further changes in the pattern that occurred in 1999. The “GIS” data from 1999 look dramatically different from usual, even from the 1998 pattern. In 1999 the peak recorded GIS is less than 6% (vs 12% in all previous years)! The graph then slopes downward and bottoms out in late June, the same time as the 1998 line. From what I can tell, the official interpretation of this is that spawning occurred much earlier than usual in 1999 and that the GIS data therefore only shows the tail end of a more or less normal graph (one with a 12% peak sloping to 0). This is wrong, however, because the slopes are different. The “6% to zero” graph in 1999 is not the same as the last half of the “12% to zero’ graph that always described the usual pattern. The 1999 graph also looks like “half of a bell curve” to me, just one that peaked at a much lower level - at only 6%. If that is true, the interpretation of stock trends becomes very different. “If” the GIS peaked at 6%, it means that the reproductive potential of the Atlantic mackerel is becoming seriously compromised. I am concerned that the interpretation of the data from 1999 was based on an “assumption” that GIS reached an earlier high point, although there was no direct evidence to support that conclusion. I have been told that the best statistic to look for when trying to prove the existence of “food shortage” is the “condition factor” in fish. (This involves a weight to length ratio and amounts to an index of “plumpness.”) A steady downward trend in condition would be consistent with steadily worsening feeding conditions. 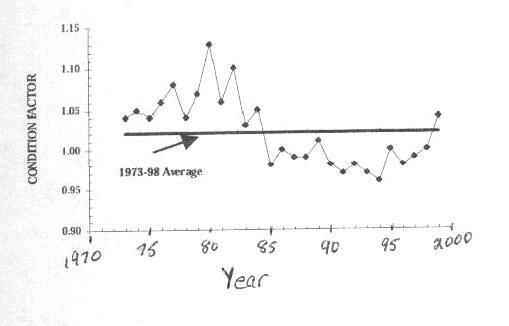 The latest report on the Atlantic mackerel includes the trend in “condition factor” from 1973-1999 (Figure 4). A horizontal line indicates the 1973-1998 average. “The condition of mackerel is at its lowest in early spring, just before and during spawning, while peak values are observed in fall. Up until and including 1984, the condition of mackerel on arrival in the Gulf was above the mean for 1973 to 1998 (Figure 4), but it fell below that mean between 1985 and 1998, a time when the Gulf water was cooling down. In 1999, it once again rose above the mean.” For consistency, the condition factor is calculated at the same time every year, in June. If for some reason the condition factors for the last two years could be removed from the graph, it would show a steady declining trend for a couple of decades. And the condition data from 1998 and 1999 should be removed from this graph for a reason that has already been described: “feeding and growth began earlier than expected...as early as June...” (All years except 1998 and 1999 show the condition of mackerel at their annual low point, in the last two years the “condition” reflects fish that have already started feeding - so, no comparison can be made.) Therefore a strong argument can be made that feeding conditions (reflected in “condition factor”) for mackerel in the Northwest Atlantic have in fact been steadily worsening for at least two decades...which is completely consistent with the “overall biomass depletion/starvation” theory. Two other growth indicators in fish are “weight-at-age” and “length-at-age,” and these are mentionned under “attributes of the stock.” The current situation is described as “Slow growth seen in year-classes from late 1990s.” It is very bothersome to me, however, to find this next comment under “recent trend” - “Growth of year-classes is inversely proportional to their abundance.” That last statement describes a principle that USED to be true for all fish stocks, but has no longer been true since the mid-1980s. Groundfish, salmon, whatever was fished...it was commonly noted that in years when the numbers were fewer that the individual fish grew better, presumably a result of fewer mouths competing for the same amount of food. Inversely, years in which fish were very abundant were the same years when individual fish were noticeably smaller. But it is a well known fact that this predictable relationship “fell apart” about 15 years ago... stocks now have low abundance and slow growth simultaneously (e.g. cod, haddock, pollock). It is a newer trend, and to me an alarming one. It is one of the main puzzles that marine biologists have been trying to decipher in recent years. Why would the statement of the OLD inverse-proportion principle be included in a "2000" fish stock assessment? I only hope that it was not one of the mistaken lines of reasoning that led to the rumour of “abundant mackerel” (...if they are growing slowly, then there must be lots of them...). My father is a “senior citizen” who has seen a lot of things in his day, including a lot of fish. He makes the best-ever smoked mackerel in his little smokehouse. The fat fall mackerel are by far the favorites for this purpose, and last year he smoked some as per usual. They were good, but...my father found it strange that the usual quantity of fat did not drip out of the mackerel in the smokehouse last year. Another clue? Maybe. Regardless, he insists that this year’s mackerel fishery will be the one that “tells the tale.” I believe he is right, and I will keep you posted. Mackerel illustration from NOAA's historical collection.